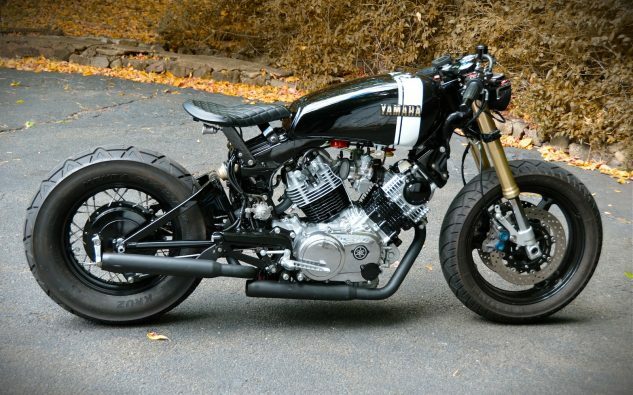 Meanwhile at BikeBrewers.com, in the Netherlands, our friend Joeri posted this custom Yamaha XV920 from New York. Well, he posted it four years ago, but we just now bumped into it while avoiding actual work. 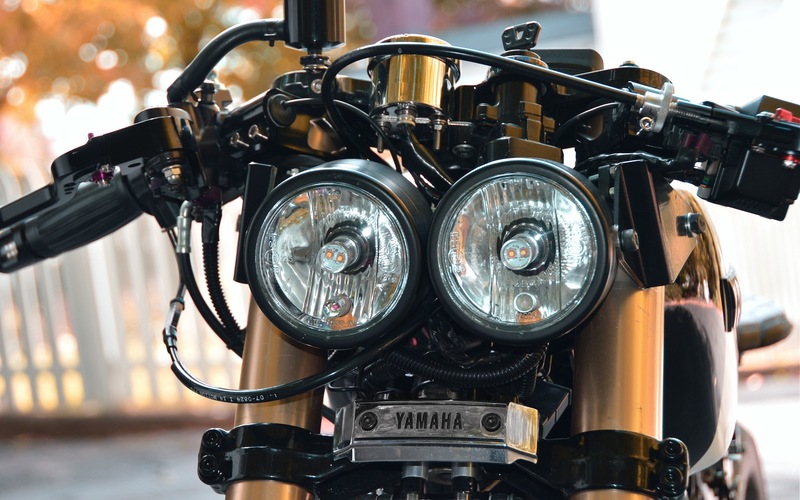 Yamaha’s all-new air-cooled overhead-cam XV750 first arrived in the States in 1981, where it sent the H-D faithful into an immediate and prolonged tizzy, as it was the first Japanese v-Twin and as such appeared to be taking direct aim at Harley-Davidson. Never mind that besides the v-Twin layout, the new XV had almost nothing in common with any Harley of the period; it was the XV that caused Congress to enact a tariff on motorcycles bigger than 700cc shortly thereafter. Later came the XV920, also a standard style motorcycle. But understated was not what America wanted from its v-Twins at the time, a thing Yamaha learned over the years as it molded the XVs into increasingly ornate Viragos – some of the gaudiest, most chrome-intensive cruisers of the `90s disco era. The early monoshock XVs, though, make some pretty cool customs. 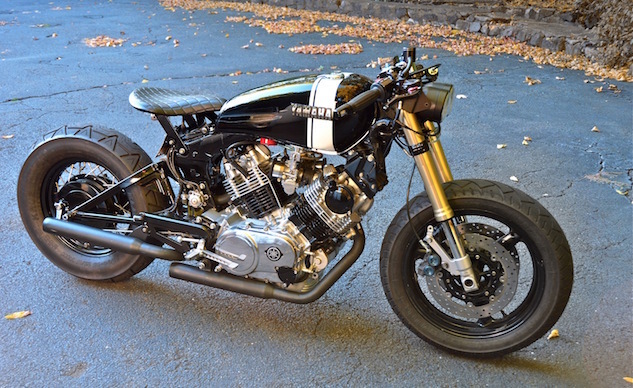 This one belongs to one David Bailey of New York (or did in 2015), and has: a 2001 Yamaha R1 front end, custom subframe and fenderless rear end, a Biltwell solo seat, Tarozzi rearsets, an XV750 gas tank and a rearview camera in lieu of mirrors. 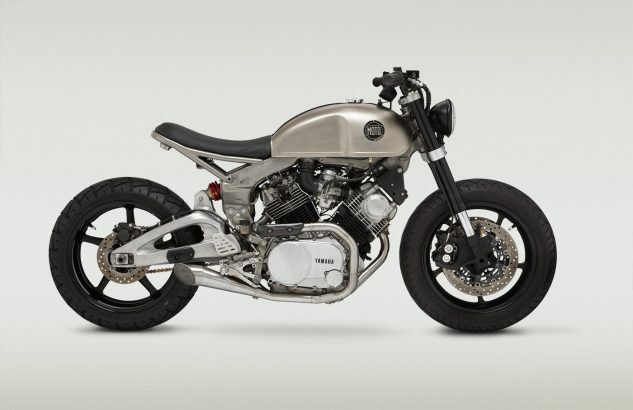 As long as you’re over there at BikeBrewers looking at this one, you might as well take a little more time to check out Joeri’s 10 Best Yamaha Virago Cafe Racers. And after you crawl out of that rabbit hole, why not fall into the domestic one over at Classifiedmoto.com, where custom XVs seem to be a cottage industry. XV920 2.0 rolls on R6 running gear, and is said to have “crazy torque, a truly pissed off V-twin sound and very few creature comforts.” I like it.